Every conversation at SXSW, or at any conference really, starts predictably. Each party is trying to find a way to connect and from previous interactions, I had found being from Austin came up quickly and often moved the conversation from pleasantries to personal interests and experiences. This was the moment I designed for, with the challenge: How do I use this to extend my impression and reach? My target was people not too familiar with Austin who shared similar interests — not hard to come by in the people I sat next to in sessions. Using interests as a conversation guide, we learn more about each other and I also know what around Austin might interest my new acquaintance. Business cards are inevitably swapped, so I made this my first sticking point. Not only could I give my information, but I could provide the location of a recommendation with a fun, simply designed map on the back. Using Moo's Printfinity product, I was able to cover my bases with recommendations from coffee and breakfast tacos to country dancing and bars and give a card tailored to the other person. Some ended up taking a few and all thumbed through the options with delight. Win! I wanted to make sure the connection didn't stop with that one recommendation. 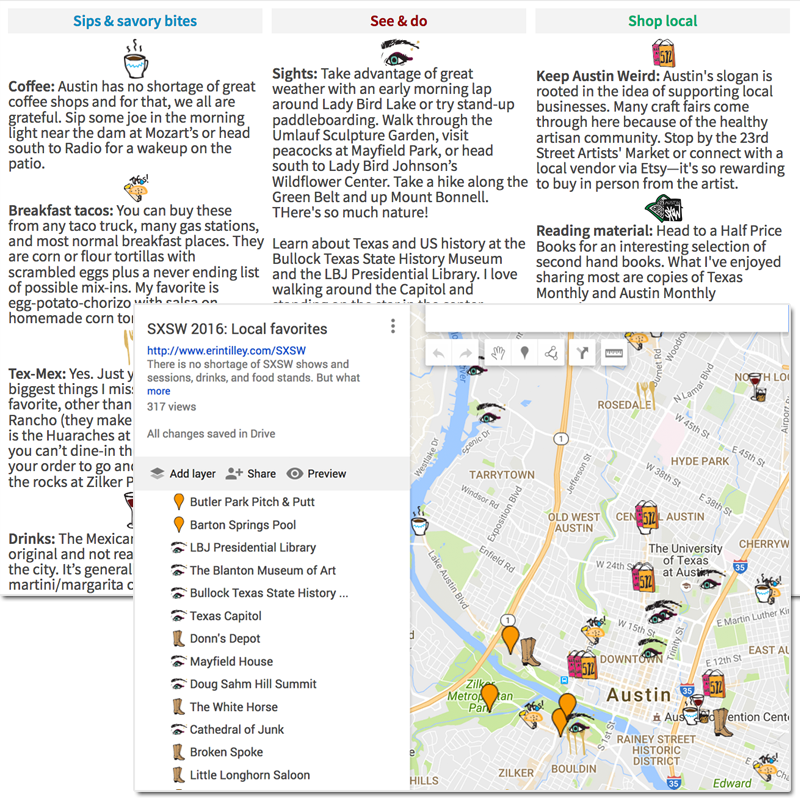 I added a page to my website that detailed out categories of things to experience in Austin, such as ordering the Huaraches from Papalote and drinking a Mexican martini, and linked a custom Google map to that page. This also increased my potential to reach a broader set of people, both through sharing and longer-lasting content (I've been able to use this beyond SXSW). Overall, the response I received was incredibly positive and led to deeper conversations on designing for experiences and career interests. The goal to make a lasting impression was met and the unique visitors to the webpage are now at over six times the number of cards I distributed.